* 1 set CISS (ink continue system, filled with 6x100ml high quality inks). if you are in Hawaii, Guam, Alaska, Puerto Rico, Saipan, please contact us for detailed shipping cost. 16" x 20" Flat Heat Press is widely used for heat transferring images to T-shirts, mouse pads, tiles and any other objects with flat surfaces. Epson Artisan 1430 Inkjet Printer With the CISS, takes photo printing to the next level of performance, delivering brilliant, Ultra Hi-Definition prints as large as 13" x 19". Printing Technology is 6-colour advanced MicroPiezo inkjet technology optimized for photo printing. 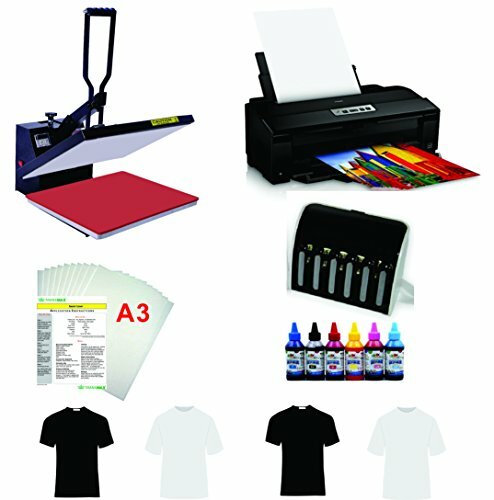 A3 Light /Dark T-shirt Transfer Paper, Can be printed with all inkjet printers. Suitable for transferring images onto cotton/cotton-mix fabrics lycra, spandex, cotton, nylon, polyester, canvas, rib knit, felt, satin, blends and natural fibers using standard inkjet inks.